Anay, Kurush Deboo, Gaurav Ghai, Bakul Thakkar, Farida, Archana . Happy Husbands is a Hindi comedy film, which is based n the story of three youngsters, who get into the marriage bonding with their sweet hearts. The film is made under the banner of Phenomenal Crafts LTD. 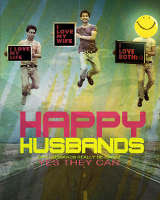 Happy Husbands is a Hindi film, which has a storyline related to henpecked husbands. The movie revolves around three couple, where the three males are being henpecked by their wives.